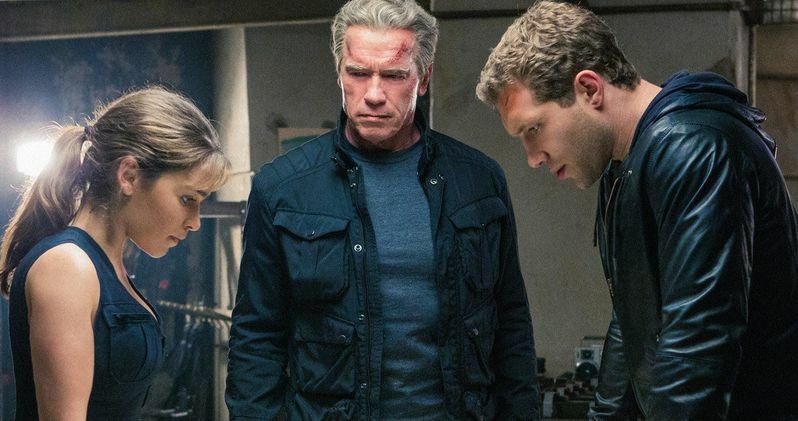 Terminator Genisys Review: Arnold's Back, But Does It Matter? There is an alarming trend in remakes/reboots that has sprouted up over the past few years, that I first noticed with a pair of 2013 releases, Carrie and Oldboy. Instead of finding any sort of new angle into the story, they were both, essentially, shot-for-shot remakes of the original, but with a shiny new cast for the 21st Century to latch on to. With that being said, Terminator Genisys doesn't qualify as such, since it does have a few new things to offer, but it's still crafted in a way that doesn't pay homage to the movies that come before it, but becomes a slave to them, bombarding us with beat upon familiar beat that is probably supposed to evoke fond memories from the originals, but instead dilutes and complicates any semblance of originality. I found it somewhat sketchy to see Paramount roll out a recent Terminator Genisys TV spot featuring the ringing endorsement from director James Cameron, who directed the first two Terminator movies, stating that this new adventure "reinvigorates" the franchise. Re-hashes, most certainly, but reinvigorates goes way too far. The beauty of 1984's The Terminator and 1991's blockbuster sequel Terminator 2: Judgment Day is that, at their core, they really aren't "time travel" movies, but merely use that device in an elegant way to tell Sarah Connor's story, and her interactions with two separate versions of the T-800 Terminators. Even the less-popular Terminator 3: Rise of the Machines didn't really delve into the mechanics of time travel that much. To paraphrase Robert Downey Jr.'s Kirk Lazarus from 2008's Tropic Thunder, Terminator Genisys goes "full time travel" (and, at times, "full retard" as well, figuratively) in what results in a convoluted mess of a movie that will most likely make you wish you had your own time machine to get those 125 precious minutes of your life back. We start off in the future, where the war between man and machine continues to rage, where the humans, lead by John Connor (Jason Clarke) are on the brink of a victory that could end the war for good. Just moments after securing this victory, they learn that Skynet has sent a Terminator back to 1984 to kill John's mother, Sarah Connor (Emilia Clarke), so John will never exist and yada yada yada. Of course, John's faithful soldier Kyle Reese (Jai Courtney) volunteers to go back and save her, since he's been in love with her ever since John gave him that photo which was taken at the end of The Terminator, but just moments before he gets sent back in time, a mysterious character named Alex (Matt Smith) grabs John, as we see mysterious micro-organisms infiltrating John for a few seconds before Kyle is gone. If you've seen the most recent TV spots and trailers which surprisingly divulged the movie's big twist, you know what happens, but I won't get into too many details because they aren't very interesting anyway. From here, the 1984 Kyle goes back to is not what he thought it would be, with Sarah saving John from a nefarious liquid-metal T-1000 (Byung-hun Lee), stealing one of Arnold Schwarzenegger's classic lines, and telling Kyle that she knows everything that is about to happen, after being raised by her "Pops" (Arnold Schwarzenegger), an aging Terminator that saved her life when she was just a little girl after other Terminators were sent by Skynet to kill HER parents. Anyway, this is basically a new timeline, and it's here where we get some semblance of interesting and original material, as Sarah and Kyle must travel forward in time to the year 2017 to stop a new software program dubbed Genisys, which syncs all of a user's data into one handy-dandy app, and, of course, is also the latest and greatest version of Skynet. The story, written by Patrick Lussier (Drive Angry) and Laeta Kalogridis (Avatar) does a nice job of bringing the franchise into this day and age, with not-so-subtle lines about how our current society basically brought on the onslaught of Skynet with our overwhelming need to stay "connected." Kyle Reese's arc is given much more meat here, showing us some of his history with John before he's sent back in time, and giving his connection to Sarah much more weight. Still, their script is littered with recycled and ridiculous dialogue, while trying its hardest to over-complicate the story by crossing into multiple different times. Terminator Genisys keeps piling on to the already-tricky nature of time travel, where, at times, I started falling into logic wormholes in my own head, trying to examine if a certain aspect of the story should work after A and B and C already happened, and such. The main actors, Arnold Schwarzenegger, Emilia Clarke, Jai Courtney and Jason Clarke all do as middling a job as possible with the material given, but the talents of Matt Smith are simply wasted here. The best brand new character added here is J.K. Simmons's O'Brien, a crazed cop in the year 2017 whose theories about time travel are given a big boost when Kyle, Sarah and "Pops" arrive, but I wish we saw more of him. Director Alan Taylor does a fine job at the helm with some of the massive action set pieces, but the constant weirdness of the story honestly distracts from a lot this movie has to offer, at least for me. Terminator Genisys is the worst kind of reboot you can imagine, because it wants to have its cake and eat it too, starting a "new" story by using either familiar or downright identical building blocks of themes, characters, lines of dialogue to build it with. You could say that the uber-blockbuster Jurassic World is guilty of the same thing, which it kind of is, but the difference is that movie does a much better job of creating a new world, with new characters in today's society, based on the iconic foundation of the original, while largely avoiding the less-successful sequels. Terminator Genisys, on the other hand, simply piles on everything that made the original movies a success on top of one another, with a few new elements to complicate things further, resulting in a movie that re-creates more than it creates, causing it to crumble under its own weight of unoriginality. Terminator Genisys hits theaters nationwide on July 1. If you agree or disagree with my review, let your voice be heard below, or on Twitter @GallagherMW. Will you be heading to your local theater to check outTerminator Genisys this weekend?